Our gates are ideal solutions for front gardens or can be used to close off specific areas within a garden, such as a vegetable patch or swimming pool. Our wirework garden gates are designed to work with the rest of our modular trellis panels and posts, and can also fit within our arches to create a complete scheme of diamond latticework. Single gates and double gates are available with a pair of gateposts for concreting into the ground, but can also be designed with hinges for wall hanging if required. We offer two standard sizes shown below, but can also make most sizes and designs to suit your requirements. Gothic Arch and 18″ Arch Side Panels (not included). the 4′ Roman Arch and 3′ Arch Side Panels (not included). The Single and Double gates are all made to order and are sold with the integral gateposts. The steel gateposts are always concreted into the ground for stability. Our gates have a handmade latch to allow closure, and each Double Gate has a drop bolt into the ground to hold one side in place when opening the other side. If your scheme or site conditions demand a different size or top profile of gate, as designers and manufacturers, we can make almost any bespoke gate design to suit your requirements. My new double gates and trellis panels look great as well as performing their original task of stopping the dog getting out, thank you very much. Your gateposts should be lowered into pre-dug holes in the ground; the gates will need to be lined up approximately 2”/50mm above ground level; set the widths appropriately to ensure that the latch engages with the gatepost (or other gate if it’s a double arrangement). However, each site will be different, so please measure the space carefully and use a spirit level and plumb bob to ensure that the gates are braced level and true prior to pouring the concrete into the holes in the ground. We can arrange delivery throughout the United Kingdom. We use an independent courier that offer next day delivery. From £29.50, the price will depend on the number of items and weight of your order; we’re happy to provide a quotation prior to placing your order. Once ready, we will contact you to arrange a convenient date for delivery. 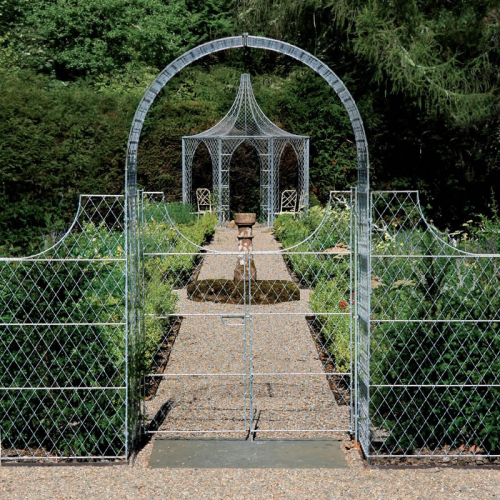 Every product is made from solid steel and hot dip zinc galvanized to a recognised British Standard EN ISO 1461, to form a corrosion resistant finish. The above range of products is available in the choice of finishes shown below. If you’re in any doubt about the finish to choose, or would like to know more about the zinc galvanizing or paint please get in touch. 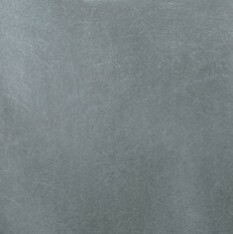 Fresh zinc has a bright silver sheen which gradually weathers to a beautiful matt, light grey finish. We reproduce the ageing process by etching the fresh zinc to achieve a darker, weathered patina. A mellow hue with a hint of green, similar to the bark of a Bay tree. The perfect colour for trellis and arches. A traditional and timeless choice for porches, canopies and fireguards that works with most properties. We can also paint our products in colours or paints specified by you.